PF Olsen is managing the harvest of Vin Alto Forest in Clevedon. The harvesting is being undertaken by Jodie and Bruiser Simpson and their team from Bruiser Contracting. Enzo Bettio the owner of the forest also owns and runs the Vin Alto Winery. 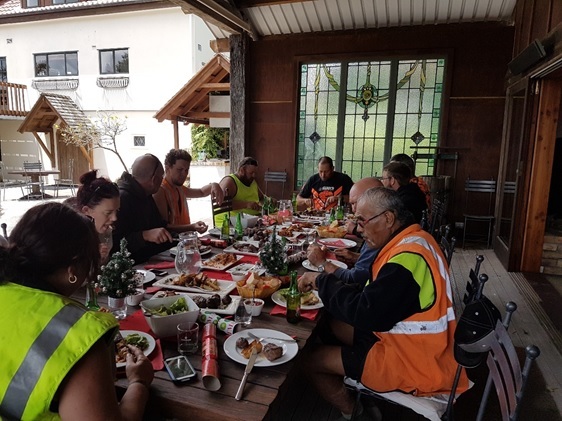 Enzo is very impressed with the harvest crew and put on a fabulous lunch spread for the crew prior to the Christmas holidays. Harvesting will finish late March and Enzo has set the bar very high for the end of job celebration! Enzo says, “They are a fantastic crew, very professional, polite and helpful. Even the neighbours are commenting on how professional and friendly they are. They definitely deserve a great celebration”.